Nicodemus first appears in the Gospel of John (3:1-2), a Pharisee and member of the Sanhedrin. Although outwardly remaining a pious Jew he comes to Jesus secretly by night to receive instruction. He appears as a learned and intelligent believer, but too timid to join in the the new faith. He also appears (John 7:50-51) in the Sanhedrim offering a word in defense of the accused Jesus. He is mentioned finally in John (19:39), where he helps Joseph of Arimathea in the embalming and burial of Jesus. Although he was eventually made a saint his dual allegiance was somewhat suspect to the church, thus not a popular subject for official church art. During the religious turmoil of the 16th century the terms Nicodemus and Nicodemite were employed by Protestant leaders to characterize Catholics who sympathized with Reformed theology, but remained in the Roman Catholic fold. The term was apparently introduced by John Calvin in 1544 in his Excuse à messieurs les Nicodemites. Since the French monarchy had increased its prosecution of heresy with the Edict of Fontainebleau (1540), it had become increasingly dangerous to profess dissident belief publicly, refuge taken by emulating Nicodemus. The description was applied to the Italian Spirituali society. The Spirituali were members within the Roman Catholic Church of a reform movement which was active from the 1510s to the 1560s. The ranks of the Spirituali included Cardinal Gasparo Contarini, Cardinal Jacopo Sadoleto, Cardinal Reginald Pole, Italian poet Vittoria Colonna, and Michelangelo. These Italian evangelicals proposed to reform the Church through a spiritual renewal and internalization of faith by each individual, viewing the study of scripture and justification by faith as means to that end. Central to the Spirituali was a renewed emphasis on the grace which God sent through faith as revealed by the Holy Spirit. A Benedictine monk Benedetto Fontanini wrote the first version of the most notable expression of Spirituali doctrine, the Beneficio di Cristo (The Benefit of Christ's Death) in 1543, attempting to prove that salvation comes through Sola fide, or 'faith in Christ alone' as Protestants believed, not through works or the Church. The group printed forty thousand copies of a book expressing their ideas, which was soon declared heretical and placed on the Index Librorum Prohibitorum. Although Spirituali occupied positions of high power within the ecclesiastical hierarchy and had the sympathy of Pope Paul III, they failed to achieve much change, and more conservative elements set the Church on a course of confrontation with the Protestants at the Council of Trent. The Spirituali's movement was doomed when Cardinal Pole, who was the choice of Pope Paul III, lost the papal election in 1549–1550 by one vote, after which their position made them suspect to both Protestants and conservative Catholics. Cardinal Pole's archenemy Cardinal Carafa, who would later become Pope Paul IV, acted to suppress the Spirituali after attaining the papacy, and under him many Spirituali went on trial before the Inquisition, thus stopping the movement and ending all hope of a Protestant-like reform from within Catholicism. Cardinal Pole fled to England and Pope Paul IV tried unsuccessfully to have him brought back before the Catholic Inquisition. 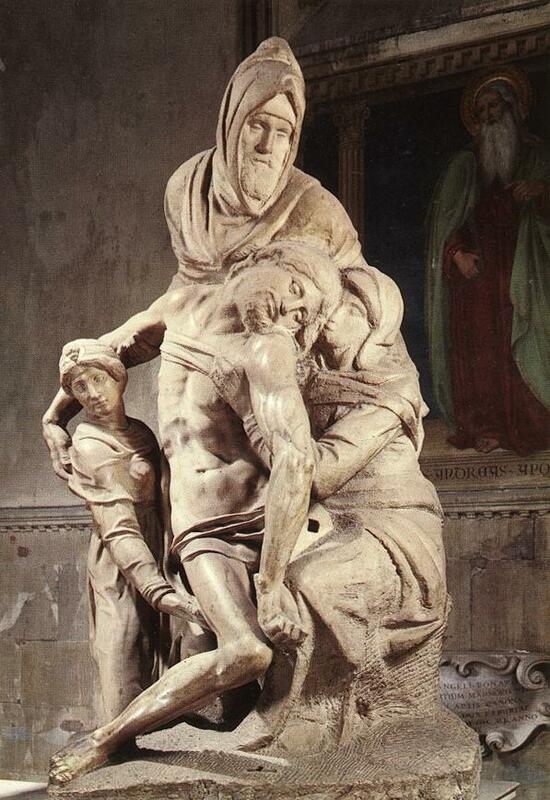 According to Vasari, Michelangelo made the Pietà to decorate his own tomb in Santa Maria Maggiore in Rome. 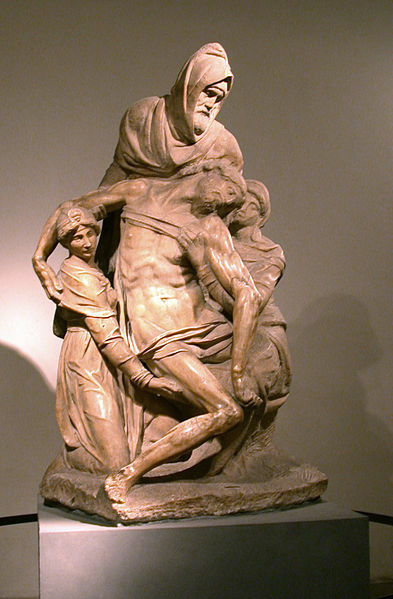 Michelangelo began work on the Pietà in 1547, but abandoned the sculpture after working on the piece for eight years. After damaging the sculpture he gave it to his servant Antonio. Later the servant sold the work and the new owner had it reconstructed by sculptor Tiberio Calcagni. The female figure on the left was finished by Calcagni. 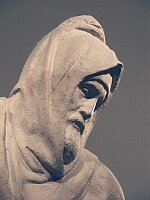 The face of Nicodemus under the hood is considered to be a self-portrait of Michelangelo himself. Michelangelo's biographer, Giorgio Vasari's account is below. However, art historians discount the validity of much of his work. I take it with a grain of salt. "He gave the broken Pieta to Francesco Bandini. While it was still in Michelangelo's house, the Florentine sculptor, Tiberio Calcagni, inquired after a long discussion why he had destroyed so admirable a per- formance. Our artist replied that he had been driven to it by Urbino, his servant, who urged him every day to finish it. Besides, a piece had broken off the arm of the Madonna. This and a vein which appeared in the marble had caused him infinite trouble and had driven him out of patience. He would have dashed the group to fragments, if Antonio had not advised him to give it to someone, even as it was. Tiberio offered Antonio two hundred crowns in gold to persuade Michelangelo to allow Tiberio to finish the group for Bandini, that the labor already spent on it might not be lost. So Michelangelo gave them the pieces, which they instantly carried away. These were put together by Tiberio, and certain parts, I know not what, added. But the death of Bandini, of Michelangelo, and of Tiberio himself, left the work unfinished after all." Michelangelo certainly had good reason to identify with Nicodemus. He was in accordance with the theology of the reformers, such as Calvin and Luther, but in no position to break with the Catholic hierarchy. Michelangelo's Last Judgement painted eight years after the Sack of Rome, which he bore witness to, is a frightening image of the condemnation of the Church. Michelangelo placed the dark entrance to Hades exactly where the gaze of the priest reading mass would fall. But he dared not go much further, the leaders of the Spirituali were eventually pursued by the Inquisition. At the Council of Trent in 1545 the Church formalized a no compromise position with the reformers. Michelangelo must have know the consequences would be dire. In 1618 the Thirty Year's War began, pitting the Protestant states against the Catholic states, Christian against Christian. We have seen the Pietà several times. Victoria once commented, "That is the saddest face I have ever seen." Some reports have Michelangelo "smashing" the sculpture, but this is not the case. 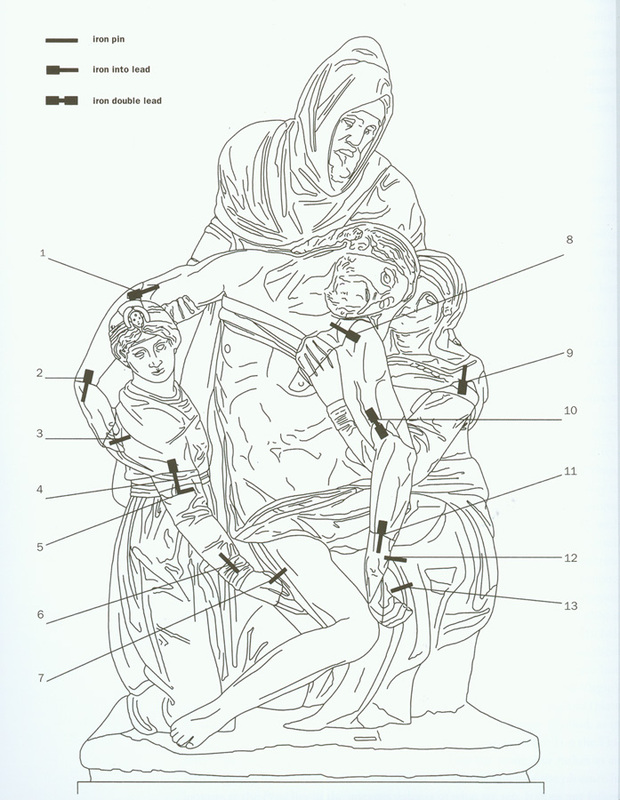 He removed the parts with a point chisel: first, Christ’s and the Virgin’s left arms, and then the right arm of the Magdalene. Then he removed Christ’s right forearm, but left the Mary Magdalene’s head intact. We do not know why he did this. Below is a sketch showing where iron pins were added by later artists. Why Michelangelo broke and abandoned a piece he had labored over for eight years is the question. Perhaps the missing leg is the key to the mystery. Christ’s left leg, which appears to have been created to hang across the thigh of the Virgin, may have been removed for compositional purposes; the sculpture might have appeared unattractive and cluttered with the left leg. So, Michelangelo removed the leg, then abandoned the piece. Response; Michelangelo had been working on the piece for eight years. Only then did he suddenly notice the hanging leg was awkward - seems unlikely. The left leg originally was slung over the Virgin’s thigh, as a symbol of a mystic union between the Virgin and Christ. However, the vulgarization of this motif might have threatened the symbolic significance that Michelangelo sought. For that reason, Michelangelo may have removed that part of the statue. Thus, ruining the piece. Response; Michelangelo had been working on the piece for eight years. Only then did he suddenly notice the hanging leg was vulgar - seems unlikely. 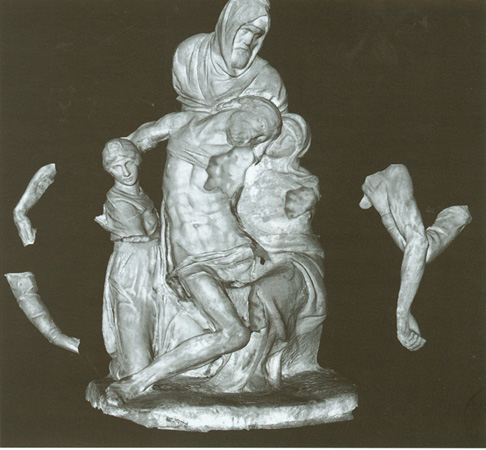 Tiberio Calcagni might have been the one to remove the left leg of Christ as he went about the rest of the statue and did not, for unknown reasons, replace the limb. Response. Calcagni misplaced the leg and was unable to find it? "Hey, Lucia, hai visto la gamba?" 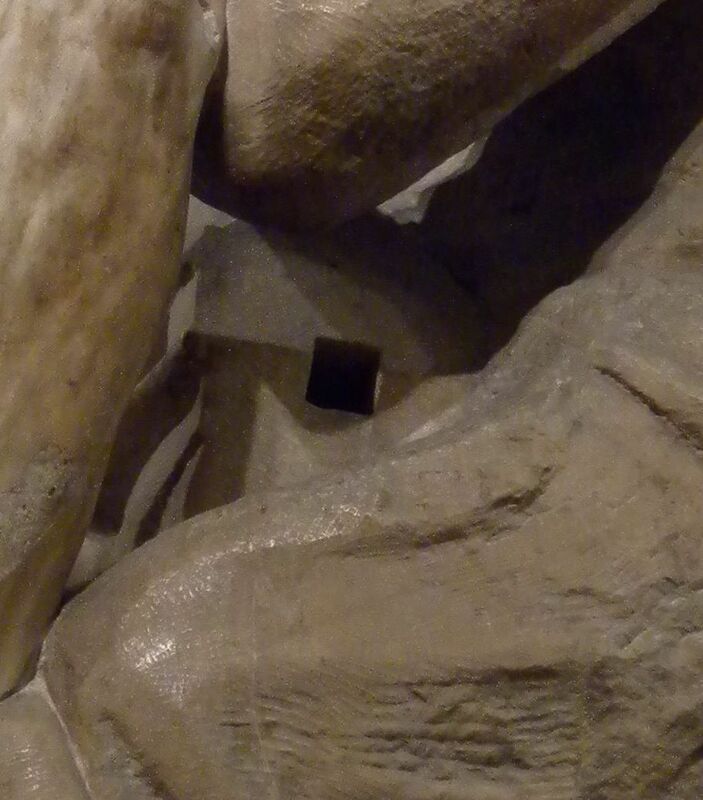 Calcagni may have created the stump (and the visible drilling hole, see above) with the intention of adding a limb. That would mean the left leg of Chirst was between the legs of Mary and out of sight to the viewer. Most viewers do not think a leg is missing, and assume it is just out of sight. Indeed, a leg dangling over Mary's thigh would be disconcerting. In conclusion, we will never know why he removed the limbs and abandoned the piece, but we can make a tentative conclusion that there was originally no missing leg. Moreover, there is a strong case that Michelangelo identified with Nicodemus rather than Joseph of Arimanthea.